Nice Work If You Can Get It isn’t particularly groundbreaking and it feels like the sort of show you’ve seen time and again (fans of My One and Only and Crazy for You will probably agree), but the new musical (a loose overhaul of the 1926 musical Oh, Kay! with a new plot and characters) for all its old-fashioned sensibilities, is much to my surprise, delightful. One of those fizzy champagne (or in this case, gin), check-your-brain-at-the-door comedies with gorgeous costumes, scenery and (most especially) songs. The book (by Joe DiPietro) is chock full of 20s silliness. The plot is negligible; something about bootleggers hiding their stash at a ritzy 47 room Long Island mansion. Farcical complications ensue with lots of colorful characters along the way. Like those period shows, the scenes are a breezy set-up for one knock-out song after another. In this instance, they are the songs of George and Ira Gershwin (with one DeSylva lyric tossed in for good measure) and the evening becomes a daffy trip through the American songbook, with 20 or so of their tunes represented. Estelle Parsons makes an eleventh-hour appearance as Broderick’s deus ex machina Mother, in a brief but winning cameo. Jennifer Laura Thompson makes vapidity irresistible, particularly in her clever bubble bath production number “Delishious.” Michael McGrath scores big laughs as the bootlegger turned butler, while the always-reliable Stanley Wayne Mathis plays a genial police officer. Robyn Hurder and Chris Sullivan are on hand as a comic couple with a combined IQ of 45. While the twosome are funny, their duet of “Blah, Blah, Blah” is unnecessary. The scene-stealer of the night is Judy Kaye. The Tony-winning soprano plays the Duchess Estonia Dulworth, a temperance-pushing battle-axe who sets speakeasies on fire in the first act, and swings drunkenly from a chandelier in the second (in the evening’s funniest scene and biggest showstopper). Derek McLane’s sets and Martin Pakledinaz’s costumes are the best kind of eye candy. Bill Elliot’s orchestrations are the best I’ve heard in quite some time and are very much of the period and a joy to hear. If a cast album is recorded – and one should be – I hope they record the exit music. David Chase has supplied some glorious vocal arrangements. Kathleen Marshall directed and choreographed, her musical staging very much in vogue with the period (and not a tap shoe in sight). There are no big production numbers like Anything Goes or Crazy For You, but her best work is in the smaller, more intimate pieces. While not as dazzling as the Encores! 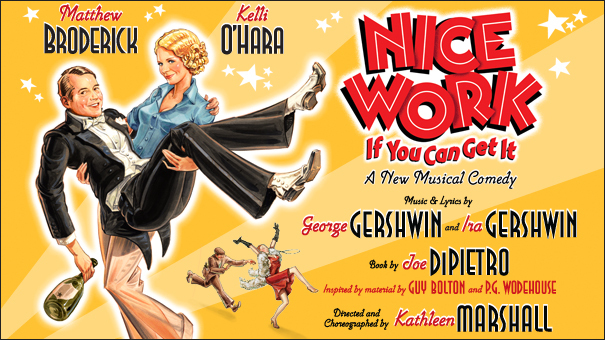 No, No, Nanette (still the best production of a 20s/30s musical comedy I’ve ever seen), there was enough crowd-pleasing charm and style in Nice Work If You Can Get It to keep me smiling from start to finish.